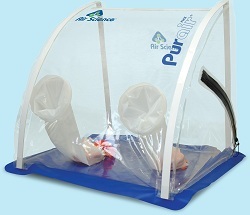 AIR SCIENCE says its new Purair Flex provides more working volume in a portable glove bag than its competitors, thanks to its innovative curved design. The device also features a double O-ring design on the standard polyurethane cuffs, which enables gloves to be changed quickly and easily, in order to accommodate different users and different dexterity requirements. Semi-rigid support rods make the Purair Flex easy to setup, and provide structural stability even if the bag is not fully inflated. It is available with a Hepa filter, bag-in/bag-out port, and optional nitrogen purge inlet connections. Dimensions are 60cm wide, 62cm high, and 60cm deep.